Original artworks, Limited edition prints, Painting on canvas, Canvas stretching, Photographs, Certificates and documents, Needleworks of all kinds, Memorabilia, 3D objects/box framing, Prints and posters, Medals, Badges, and even wild boar skulls...yes I have framed one! Our job is to minimise the nasty effects caused by UV light, airborne pollutants, humidity and those little insects that love eating the binding glues in paper, because we want your treasured item to last! How many times have you seen a photograph stick to the glass of a readymade frame? Humidity and condensation are a big cause of this happening to your photographs. Sure, if it's happened to a little family snap shot which can be reprinted, no big deal right, just print another one, but when you invest in gorgeous wedding photography or precious family portraits, you need to know they are safe while hanging on the wall. The methods we use guarantee this won't happen to your photographs. As preservation framers we understand how to protect the item being framed so you can admire them for a lifetime. Your treasured items whether they be art on paper (Watercolours, etchings, documents), medals or ribbions or artwork of any medium (photographs, canvas, LTD Prints) we understand how to frame them to Protect, Preserve and Present them for longevity. We also frame needleworks, memorabilia, prints and posters and certificates. Don't be concerned if you have purchased a painting which hasn't been stretched. Stretching a canvas is a process we can do for you. You can make a unique custom mirror in the frame of your choice. We have antique style frames, rustic frames and plenty of modern frames. Our beautiful bevelled mirrors can be made to the size that suits your space! We can remove broken glass and replace it with your choice of glass bringing your frame back to life. Same day glass replacement is available. We have hundreds of mat colours to choose frame so if you already have a frame, we can cut a mat to fit your picture to the frame. If you are looking to re farme something altogether, we can assist you in carefully removing it from the old frame to select something brand new to revitalise it. We have worked with many HSC Art students in previous years to present their works on paper. We offer 10% off for matting and mounting of works for 2019 HSC student. If there is something we haven't covered whether it be insurance quotes or bulk order quotes, please give us a call on 0415 596 414 to have a chat. 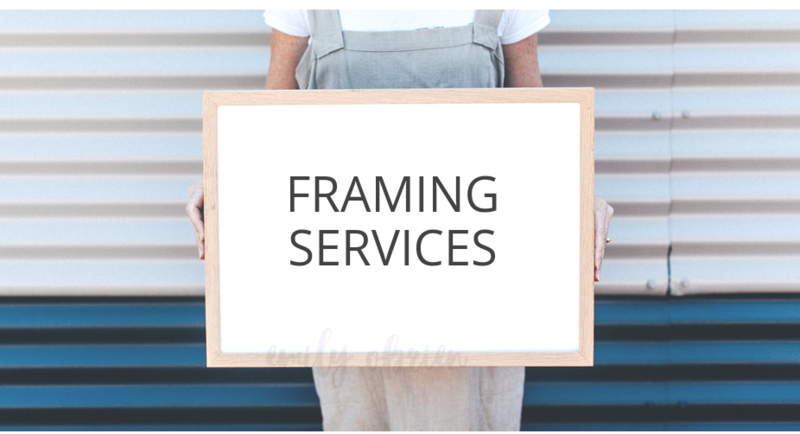 Let's chat about your framing project!